Did You Know That A Small, 4-Inch Tool Called A Wedge Can Efficiently Split Stubborn, Knotty Logs much better than an axe Can? Find It Hard To Believe? Well, It’s Time You Did As It’s, In Fact, Better To Use A Wedge To Split Wood Than An Ax As Its Dangerous Splitting Wood With Axes. Axes are better used for chopping down trees and to cut smaller pieces of wood. This is why experts suggest using wedges or prying triangles to split gnarly and stubborn logs with tough fibers that make splitting wood so tricky. what is a splitting wedge ? 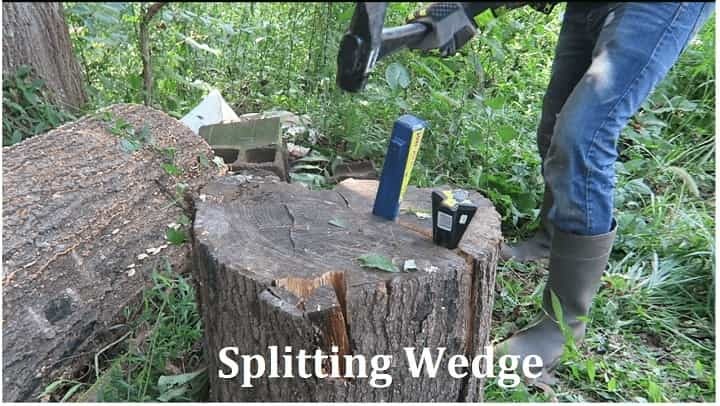 how do you split wood with a wedge ? Well, it’s just a metal wedge closely resembling a maul head that’s used for applying downward and outward force like a maul head. They provide the solution for splitting too big wood or so knotted wood that your maul bounces off it. You, however, need some practice to effectively use your wedge. You need to directly strike it with the maul’s flat side so that the wedge gets correctly embedded in the log to split. Be persistent as you may get frustrated the first few times using the wedge as it either falls out or doesn’t give you the split you want. You need a little patience, and ​and practice to splitting wood with a the best wedge. Here is a rundown of how you should do it explaining everything you have to do starting with a list of the necessary tools to clearing the spot of obstructions and to embedding and then removing the wedge from the log before splitting it into pieces. ​To start splitting wood with a wedge, you first need to wear your protective gear comprising of safety glasses, work gloves, and sturdy boots to avoid possible injury. You also need a 3-5 lb. Wedge and a sledgehammer or wood axe weighing 3 to 9 pounds. You also need a chopping block to provide support for the wood you plan to split. Clean the area of obstructions by removing all plants, chairs, small limbs and other potentially dangerous items. The ground also has to be leveled so that both your legs are firmly set while swinging. The area cleaned should be at least twice as wide as the maul’s length. Your chopping block should preferably be 12 inches high and 10-18 inches across and can be an old stump or sections of hardwood tree. Never clop wood directly against the ground as it risks the axe and wood piece flying off at the wrong angle, and your cutting edge dulling after striking the soil. With a dull cutting edge, you need to put in more efforts to split your wood. Besides the chopping block absorbs the force of each blow and gives a spot for the wedge to break through if you miss your mark. You have to place the wood to be cut on its end on the chopping block and then place the wedge’s cutting edge against the spot you want to split. Look for weak spots on the log where the wood naturally wants to split and try striking there first for an easier cut. Cracks radiating from the center are the best place to start, but if there isn’t any, aim straight down the middle and do the following. Hold it about 6-10 inches back from the head and using the maul’s hammer side, hit the wedge in place. The wedge should be firmly embedded, about an inch and a half in the wood, so that it doesn’t fly off when struck. It’s a bit more difficult splitting thick-barked wood than thin-barked wood. Now that the wedge is firmly embedded in place, you have to next drive the wedge in. Do this by standing back from the chopping block; with your legs spread about 2 feet apart. Now move your lead foot, which is the foot opposite your strongest arm, slightly forward. This means that if you are right-handed, your lead foot is your left foot and vice versa. Swing the maul in a continuous motion from above your right, (or left if you are left-handed) shoulder down till it hits exactly on top of the wedge. While swinging just a maul to chop wood, your strike will be with the flat side. In most cases, the log splits when you hit it with the splitting force of a wedge and hammer. In fact, a single wedge doesn’t do the trick, you can try driving a second wedge into the crack, but in the log’s opposite direction. This creates another splinter which may just do the trick. There, however, are a few cases where the log may not split even under such pressure, like extremely knotted logs. If this is the case, just throw the log to the side as no log is worth so much effort! Once you have a good split in the log with the wedge, remove the wedge first, before using the maul to split the entire log. While you may leave it in, there is a chance of your maul’s blade getting dull if you accidentally strike the wedge with it. There is also the risk of your strike sending metal shards upwards, which is something you want to avoid! There’s not much you need to do to remove the wedge from the log. Strike its body with the maul’s flat end so that the wedge loosens from the split. While this requires some effort, don’t hurry or hit too hard as the wedge will soon come out. Now that you know how do you use a splitting wedge, you can now split up as much wood as required to keep your firewood burning, and make your home warm throughout winter!